Alilauro run crossings from Sorrento to Ischia every day during the summer. 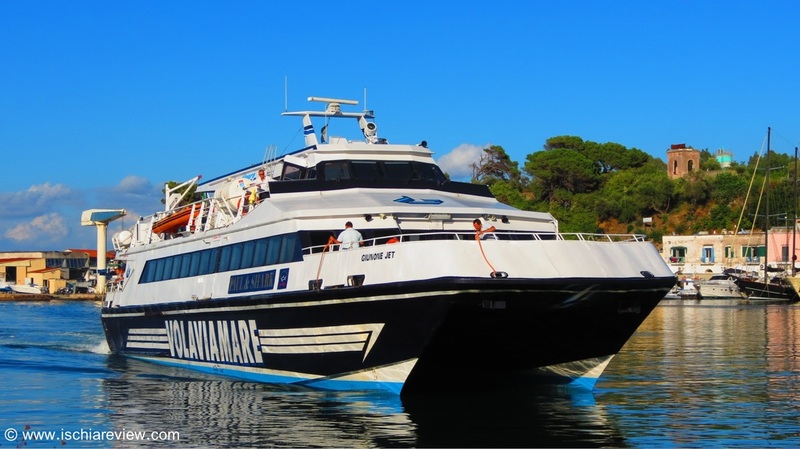 A day trip to Ischia from Sorrento is made easy by the daily hydrofoil service during the summer. Here you can buy tickets and check the timetables. We've also included crossing times between Sorrento and Capri. ​We can now also offer private excursions to Capri and Sorrento for groups of up to 5 passengers. For prices of these tours please contact us by e-mail at info@ischiareview.com. ﻿During the summer months you can take a day-trip from Sorrento to Ischia. The schedules allow you to enjoy a day in Ischia before returning to Sorrento. There are two crossings each way per day provided by a company called Alilauro from April 1st 2019 until October 31st 2019. The 9:10am service stops at the island of Procida before Ischia Porto. The departure on Mondays for this service is from 1st May to 30th September only. From 1st October to 30th September all morning departures are at 9:30am and do not stop in Procida. We've got lots of great ideas to make sure you maximise the time you have to spend in Ischia including a wide range of tours with a funky micro taxi or a regular air-conditioned saloon. We can show you the sights from the sea as well as by land, take you to a thermal spa for the afternoon, a restaurant that can only be reached by sea or how about some wine-tasting and home-made food? You can buy your tickets from Sorrento to Ischia via our booking engine below. Please note, if purchasing tickets via the booking engine charges apply that can be avoided if you buy directly from the port. The booking engine is supplied in order to provide a pre-booking option to our site visitors and the charges are not levied by Ischia Review. If making your reservation via the booking engine above, please be aware that the tickets are provided by a partner company called Traghettilines/OK Ferry who are also responsible for all transactions including payment and despatch of tickets. Any queries relating to the issue of tickets should be directed towards them on their mail address which is prenotazioni@traghettilines.it or by phone on (0039) 0565 912191. Journey times are between 20 - 25 minutes depending on maritime conditions. If making your reservation via the booking engine above, please be aware that the tickets are provided by a partner site called "Traghettilines.it" who are also responsible for all transactions including payment and despatch of tickets.